Water is Colorado's most precious resource—but demand will soon outstrip supply, threatening wildlife and communities. Colorado's rivers are an integral part of the state's unique heritage and way of life. Rivers support wildlife, agriculture, and a multi-billion dollar tourism industry. They define Colorado itself. 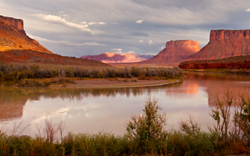 Take Action: Demand that the Colorado Water Conservation Board makes rivers a priority in the state’s first-ever water plan. Gov. Hickenlooper has said that "every conversation about water should begin with conservation," and I could not agree more. Water is our most precious natural resource and we must take steps now to protect and preserve it in a way that will benefit Colorado's rivers, wildlife, recreation, agriculture, businesses and residents. As you oversee the creation of a plan to meet our future water needs, I urge you to prioritize the following goals: 1. Keep Colorado's rivers healthy and flowing. Colorado's rivers are an integral part of our unique heritage and way of life. Rivers support our wildlife, agriculture, and a multi-billion dollar tourism industry. Protecting and restoring our rivers must be a top priority. 2. Increasing and prioritizing efficiency and conservation are crucial to our ability to meet our growing water needs. State studies have shown that existing water conservation efforts will have to expanded to ensure we can meet the needs of a growing population. Expand conservation incentives, increase indoor and outdoor efficiency and support recycling programs. 3. Help farmers and ranchers increase their profits and productivity through investments in modernizing agricultural and water sharing practices. The state should support voluntary, compensated, and flexible water-sharing agreements between agricultural producers and growing communities while respecting their water rights, as well as incentives to improve agricultural infrastructure that benefits operations and rivers. 4. Avoid new, large, trans-mountain water diversion projects. Trans-mountain diversion projects that drain water from West Slope rivers to supply growing Front Range demands are controversial, costly and damaging. Prioritize conservation and reuse so we can make every drop count and avoid the need for these projects. Thank you for helping to keep these four goals at the forefront of Colorado's water plan drafting process.